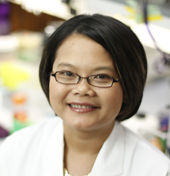 A study led by Vanderbilt-Ingram Cancer Center (VICC) investigators suggests a drug combination which includes a PDK1 protein blocker may be more effective for breast cancer that has become resistant to cyclin-dependent kinase (CDK4/6) targeted therapy. The study, published in Cancer Research, was led by first author Valerie Jansen, M.D., Ph.D., instructor in Medicine. A hallmark of cancer cells is that they grow uncontrollably. CDK4 and CDK6 are cell cycle proteins that control cell division. Medications that target CDK4/6 block this cancer cell growth. CDK4/6 targeted medications, used in combination with estrogen blockers, are already in use for patients with advanced breast cancer whose cancer is driven by the hormone estrogen. But eventually the cancer cells develop resistance to the CDK4/6 drugs and the cancer starts growing again. “Understanding how the cancer stops responding to the medication can help us develop new agents or strategies to overcome resistance,” Jansen said. In the laboratory, Jansen screened more than 700 proteins to see which proteins when blocked would cooperate or synergize with a CDK4/6 inhibitor to kill more breast cancer cells and the PDK1 protein was the top candidate. PDK1 is expressed in several types of cancer, including breast cancer. “I found that by using an experimental drug to knock down PDK1, in combination with the CDK4/6 inhibitor ribociclib which has now been approved by the Food and Drug Administration (FDA), there were more cancer cells that died in the petri dish and the tumors in mice also were smaller,” Jansen said. Jansen and colleagues took this one step further and induced resistance to ribociclib in several breast cancer cell lines after long-term exposure to the agent. They then found that PDK1 expression was higher in the resistant cell lines and the breast cancer cells continued to grow in the presence of the drug. The addition of the PDK1 inhibitors appeared to re-sensitive the cancer cells to CDK4/6 drugs so they became effective, again. Jansen said the next step is to determine how PDK1 is regulating this process. Jansen said VICC has several clinical trials testing CDK4/6 inhibitors with estrogen blockers including a trial in patients whose disease progresses after CDK4/6 inhibitor treatment to determine whether to continue with that therapy. “I’m interested in looking at that from a laboratory standpoint and this research suggests that we should continue the CDK4/6 therapy along with estrogen blockers and perhaps add a third drug,” Jansen said. The research was supported by funding from the Susan G. Komen for the Cure Foundation, the Breast Cancer Research Foundation, Research Specialist Award from the National Cancer Institute (NCI), a division of the National Institutes of Health, (1R50CA211206), Conquer Cancer Foundation of ASCO Young Investigator Award supported by the Breast Cancer Research Foundation and the Vanderbilt Clinical Oncology Research Career Development Program supported by NCI (2K12CA090625-17). Other investigators for this project include Neil Bhola, Joshua Bauer, Luigi Formisano, Kyung-min Lee, Katherine Hutchinson, Preston Moore, Mónica Valéria Estrada, Violeta Sánchez, Paula Ericcson, Melinda Sanders, Carlos Arteaga, David Riddle, Teresa Dugger, Vanderbilt; Agnieszka Witkiewicz, Erik Knudsen, University of Arizona; Paula Pohlmann and Michael Pishvaian, Lombardi Comprehensive Cancer Center, Georgetown University Medical Center, Washington, D.C.; Wenyi Wei, Beth Israel Deaconess Medical Center, Harvard Medical School, Boston.